Given the amount of personalisation that can go into the development of a superyacht, it’s hardly surprising that many owners want to preserve their creation for the ages. It is this desire that has inspired Galeria de Prado in Marbella to create a new art experience in which yachts are immortalised in an oil on canvas masterpiece. As well as this Monet-inspired painting of 111 metre Blohm + Voss superyacht Vintage (pictured above), the gallery hopes to commission works in the style of Turner, Gaugin, Homer and Renior to name just a few. Gallery founder Leticia de Prado explained: “The service is very personal, it is aimed to provide you with a new art experience. An art connoisseur will discuss your preferences and provide you with insights and proof free of charge, making sure you’re fully satisfied.” However, this isn’t the only way to ensure your yacht can be admired in perpetuity. Read on for three more ways to immortalise your superyacht. Given the amount of personalisation that can go into the development of a superyacht, it’s hardly surprising that many owners want to preserve their creation for the ages. It is this desire that has inspired Galeria de Prado in Marbella to create a new art experience in which yachts are immortalised in an oil on canvas masterpiece. 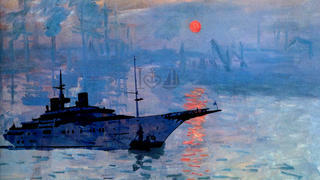 As well as this Monet-inspired painting of 111 metre Blohm + Voss superyacht Vintage (pictured above), the gallery hopes to commission works in the style of Turner, Gaugin, Homer and Renior to name just a few. However, this isn’t the only way to ensure your yacht can be admired in perpetuity. Read on for three more ways to immortalise your superyacht. Some of the most iconic superyachts of the 20th century have starred on the silver screen — surely the most exclusive way to immortalise your yacht. As we revealed in our March 2015 Yachts on Film special edition, the history of cinema is full of classic cruisers. Take Errol Flynn’s sailing yacht Zaca M for example, which was chartered by Orson Welles to shoot the 1947 film noir hit The Lady From Shanghai, starring Rita Hayworth. More recently, the latest James Bond movies have seen a revival in yachts on the silver screen. Spirit Yachts’ graceful 16 metre Soufrière was built for the 2006 James Bond movie Casino Royale, while 56 metre Pruva yacht Regina (pictured above) doubled up as Chimera for the 2012 film Skyfall. Some of the most iconic superyachts of the 20th century have starred on the silver screen — surely the most exclusive way to immortalise your yacht. As we revealed in our March 2015 Yachts on Film special edition, the history of cinema is full of classic cruisers. Take Errol Flynn’s sailing yacht Zaca M for example, which was chartered by Orson Welles to shoot the 1947 film noir hit The Lady From Shanghai, starring Rita Hayworth. More recently, the latest James Bond movies have seen a revival in yachts on the silver screen. Spirit Yachts’ graceful 16 metre Soufrière was built for the 2006 James Bond movie Casino Royale, while 56 metre Pruva yacht Regina (pictured above) doubled up as Chimera for the 2012 film Skyfall. 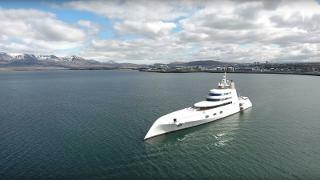 Of course you don’t need the glamour of a big-budget movie to immortalise your yacht on film, in fact it’s never been easier to capture video of her best side with the rise of superyacht drone videos. Some of the recent superyachts to be caught on drone camera by curious locals include Motor Yacht A (pictured above), Silver Fast and Venus. And the range of drones for superyachts is growing all the time, with popular models on the market from DJI, Airdog and Axis. Of course you don’t need the glamour of a big-budget movie to immortalise your yacht on film, in fact it’s never been easier to capture video of her best side with the rise of superyacht drone videos. Some of the recent superyachts to be caught on drone camera by curious locals include Motor Yacht A (pictured above), Silver Fast and Venus. And the range of drones for superyachts is growing all the time, with popular models on the market from DJI, Airdog and Axis. Of course there is one more way to immortalise your superyacht on a smaller scale — by creating a scale model. These popular replicas can be used as a reminder of the graceful dimensions of your yacht even when you are miles away from your floating idyll. What’s more, these models can be highly valuable collector’s items — a scale model of the luxury ocean liner RMS Mauretania (pictured above) fetched £162,000 when auctioned off at London’s Pullman Gallery in May 2015. Of course there is one more way to immortalise your superyacht on a smaller scale — by creating a scale model. These popular replicas can be used as a reminder of the graceful dimensions of your yacht even when you are miles away from your floating idyll. 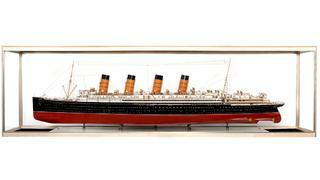 What’s more, these models can be highly valuable collector’s items — a scale model of the luxury ocean liner RMS Mauretania (pictured above) fetched £162,000 when auctioned off at London’s Pullman Gallery in May 2015.